For years Democratic Rep. Kyrsten Sinema (Ariz.) mocked Arizona in speeches around the country, and new video shows she recycled her favorite line calling the state "crazy." "All of us who have been in Arizona for a long time, people like myself who are native born, will remember learning in second or third grade about the five C’s," she told an Arizona crowd in a video shared by National Republican Senatorial Committee. "Cotton, cattle, citrus, climate, and copper. Well I think we should add a sixth, and it’s called crazy." This was a joke she also used in Texas, where she explained Arizona was "crazy" because of the state’s politics, which were predominately Republican. 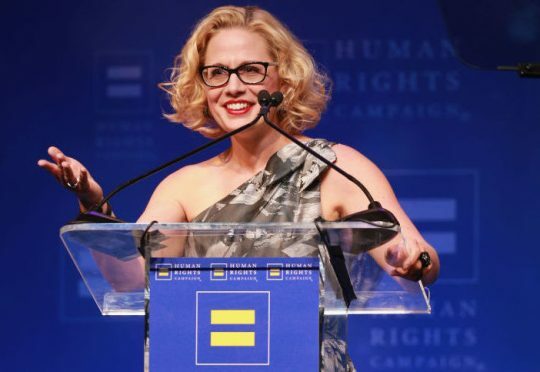 That 2011 video led to a cascade of others being released showing Sinema criticizing and mocking the state she is now running to represent in the U.S. Senate. In 2010, Sinema noted Americans have used the term "laboratories of democracy" to describe states, and she said that made Arizona "the meth lab of democracy." The next year she compared Arizona to actress Lindsay Lohan, who was dominating the news at the time because of her drug abuse. "We're not famous in a good way; we're famous in a Lindsay Lohan kind of way," Sinema said. "Not good." Sinema has raised eyebrows with her comments about her country, as well. She said in 2003 she was fine with Americans joining the Taliban—a statement she refused to address during a debate Monday—and she also equated the deaths of military servicemen with those of illegal border crossers. "To state that immigration is not a war or is not equal in magnitude to war, I believe, dishonors those who have died in this country and others as migrants," she said in 2006, explaining her opposition to border enforcement. Sinema has rebranded herself as a moderate in Congress and has tried to run that way against Rep. Martha McSally, who is campaigning to keep retiring Sen. Jeff Flake’s seat Republican. Sinema mostly led in the polls for several weeks but the most recent polls have shown a dead heat. This entry was posted in Politics and tagged Arizona, Kyrsten Sinema, Martha McSally. Bookmark the permalink.